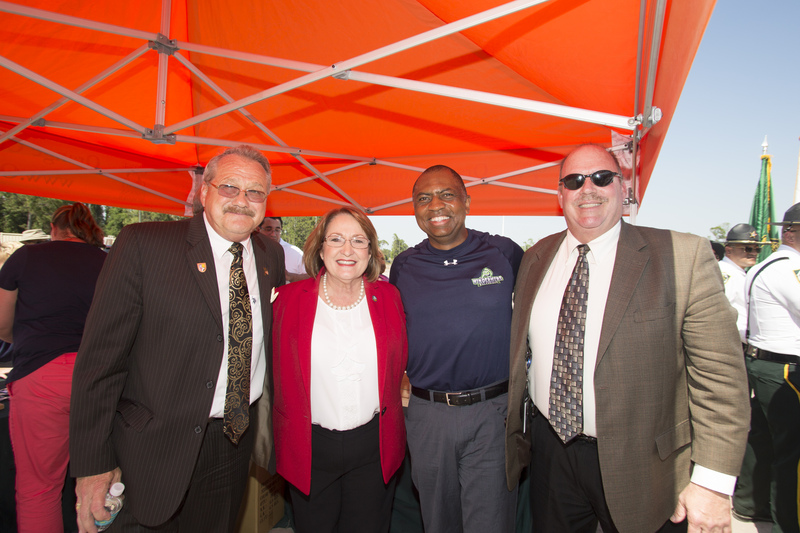 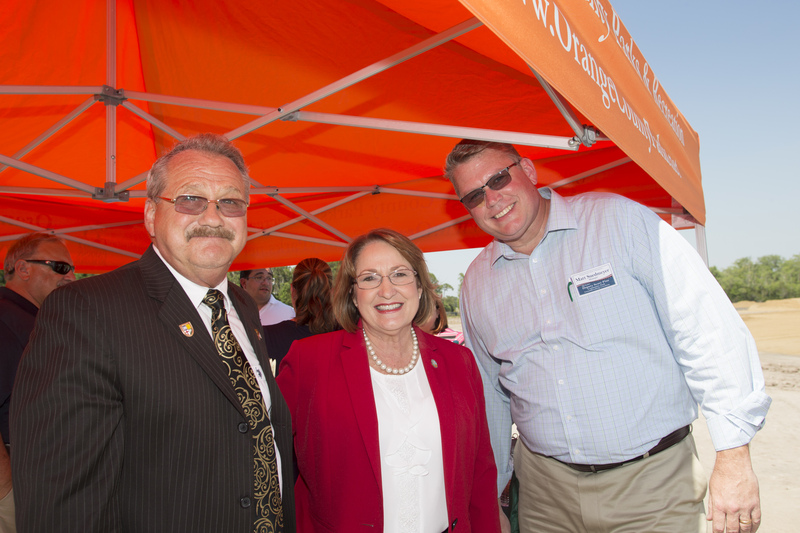 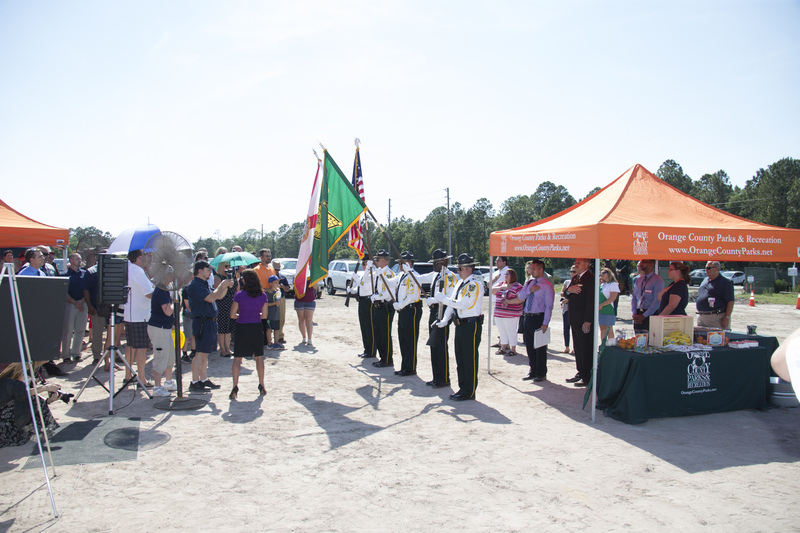 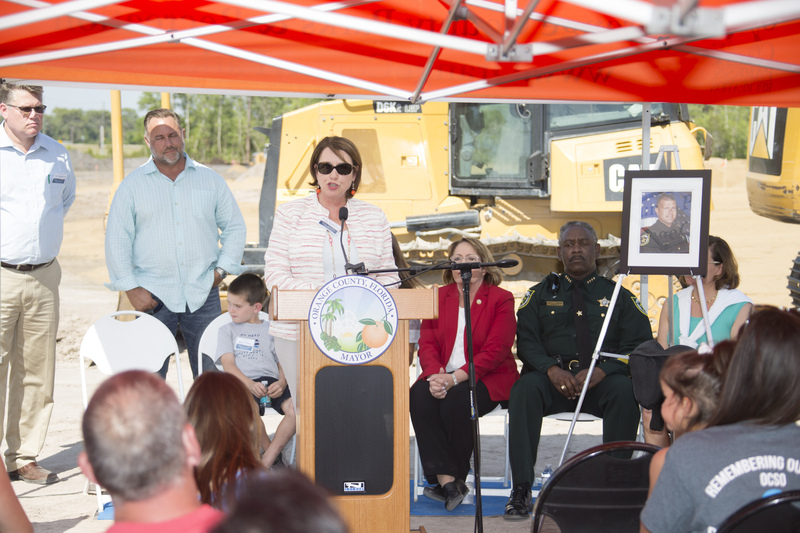 Orange County Mayor Teresa Jacobs, Orange County District 1 Commissioner Betsy VanderLey, Orange County Sheriff Jerry Demings and the Orange County Parks and Recreation Division celebrated the groundbreaking of the Deputy Scott Pine Community Park with numerous dignitaries, guests and law enforcement community. 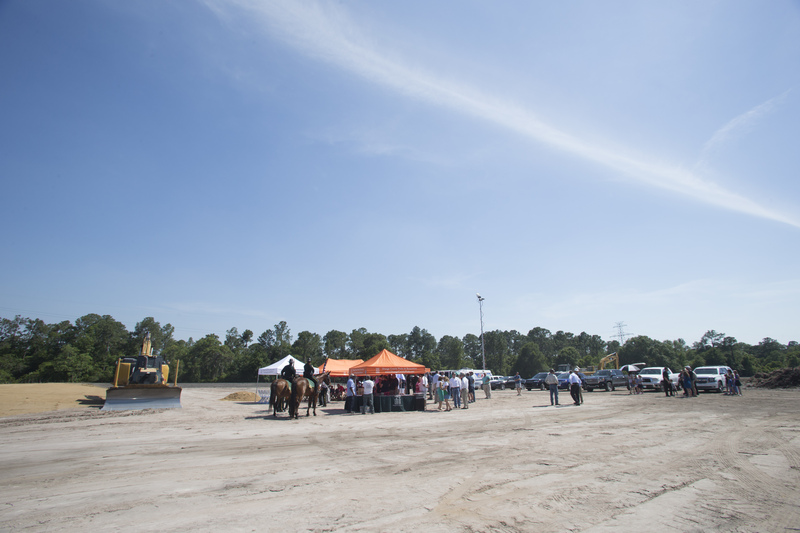 The 19.5-acre property is located at 17199 Ficquette Road in Windermere, south of C.R. 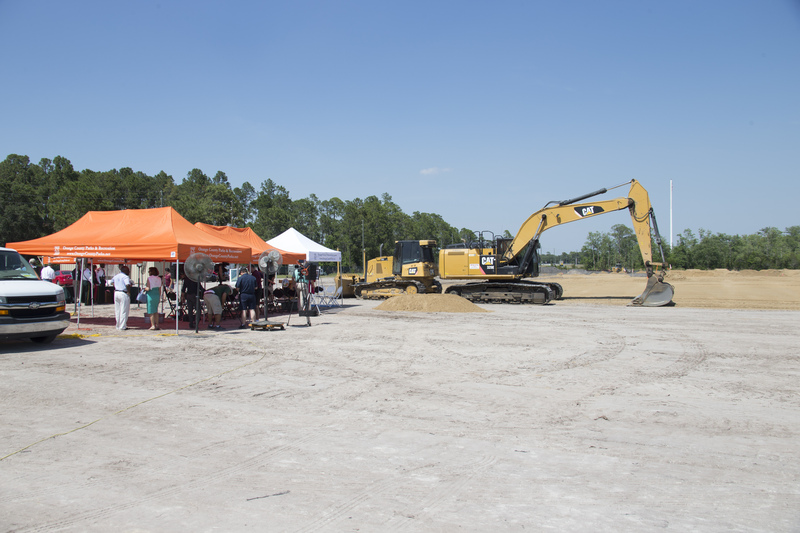 535/Winter Garden – Vineland Road. 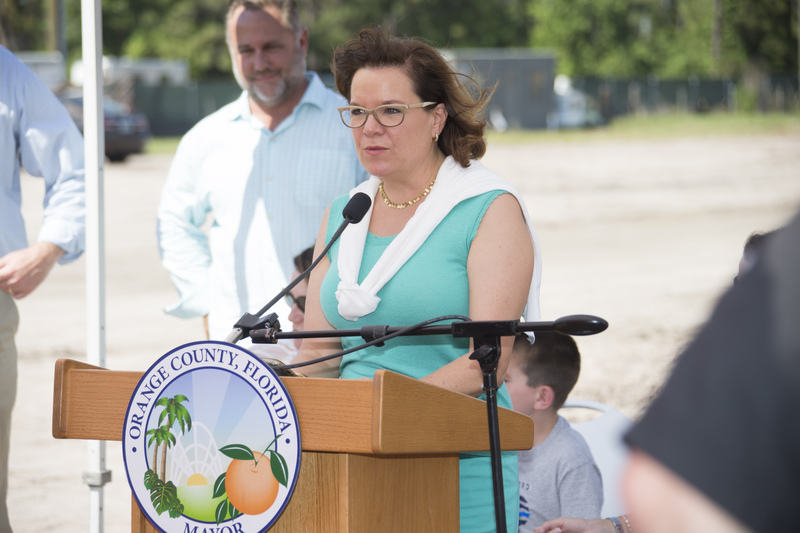 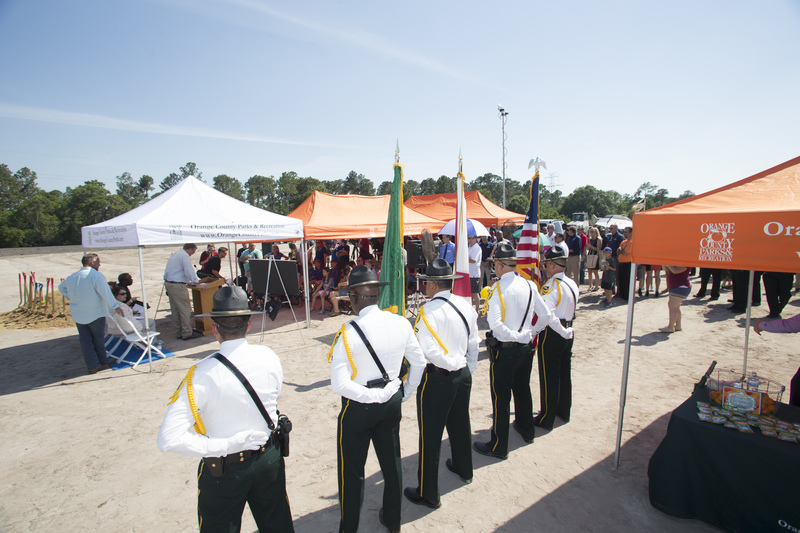 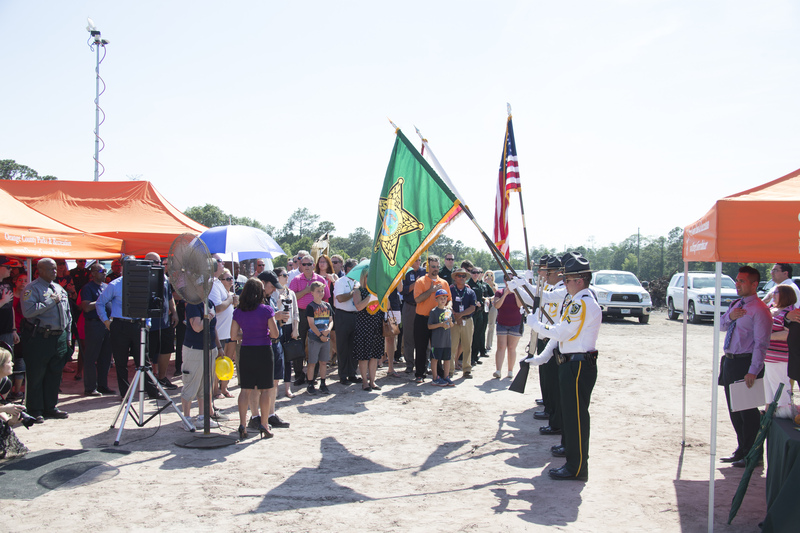 Funding for the Deputy Scott Pine Community Park came from the Orange County Public Schools (OCPS) and Orange County INVEST funds. 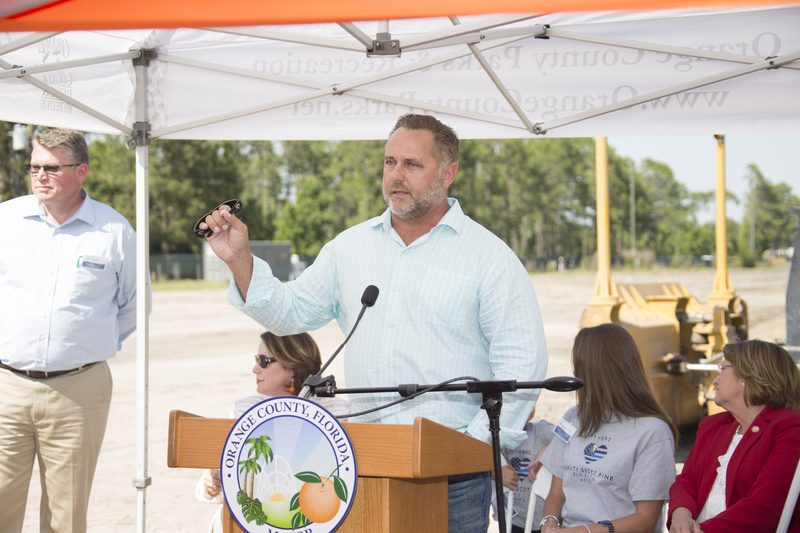 Through INVEST, $3.7 million was allocated under former District 1 Commissioner S. Scott Boyd and $3.7 million were matched by OCPS. 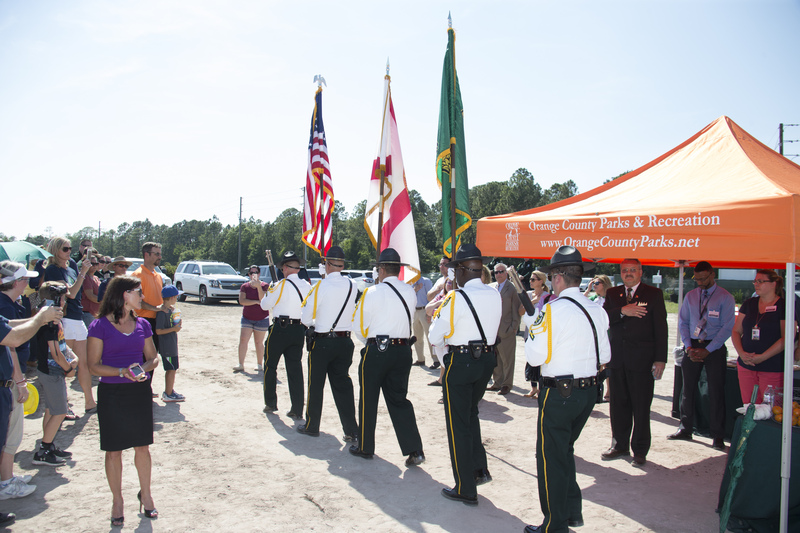 The remaining funds come from Orange County Parks and Recreation capital improvement program funds. The total construction cost for the project is $9.7 million. 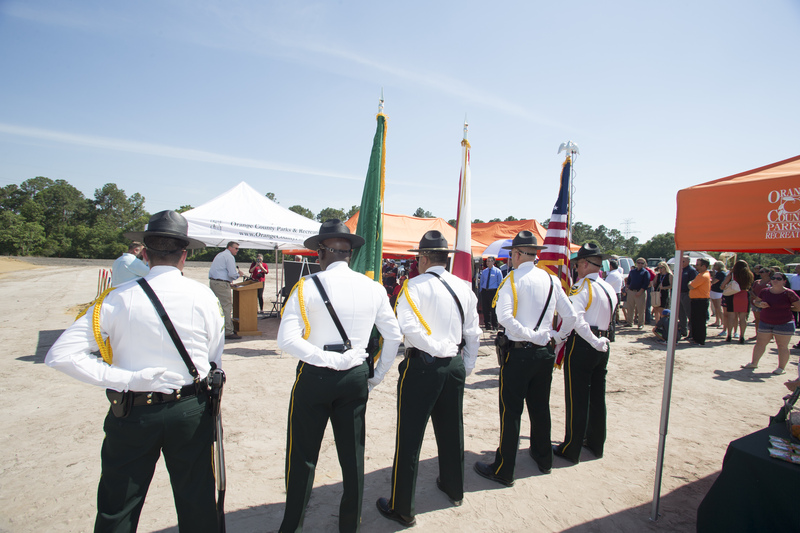 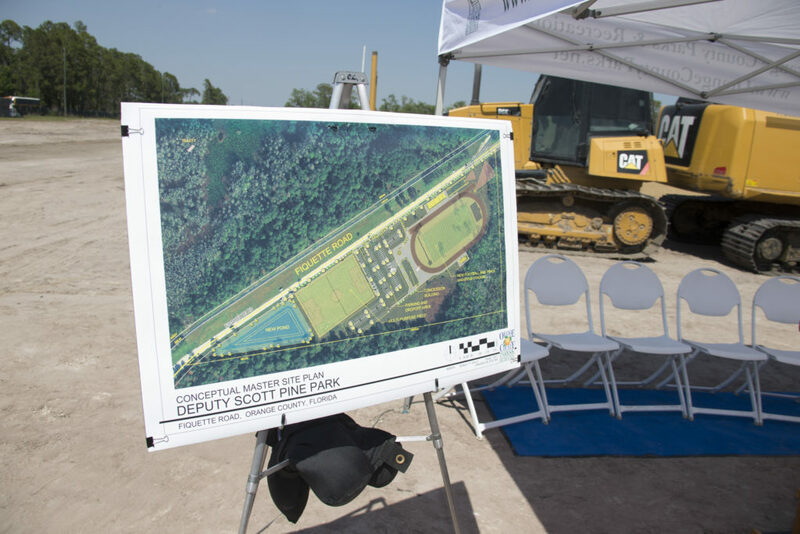 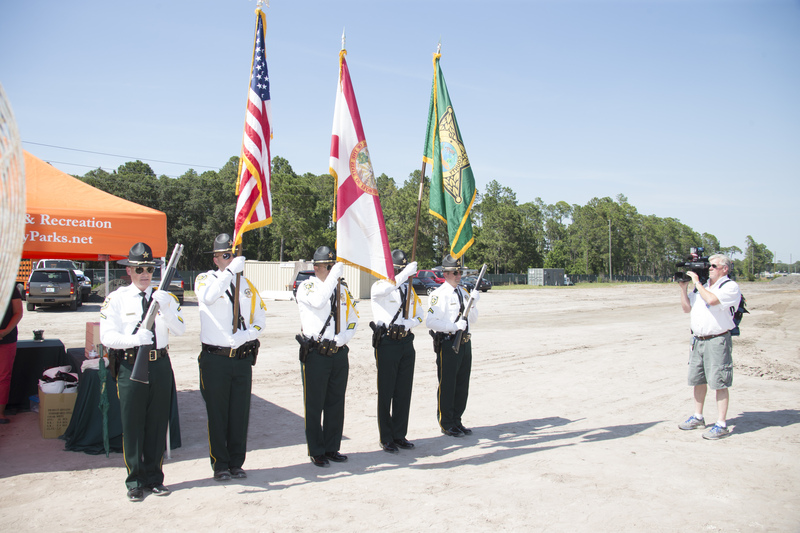 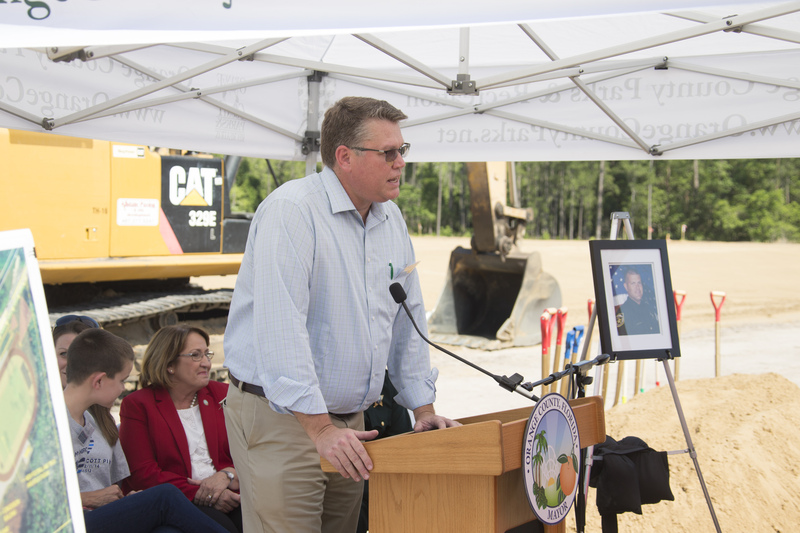 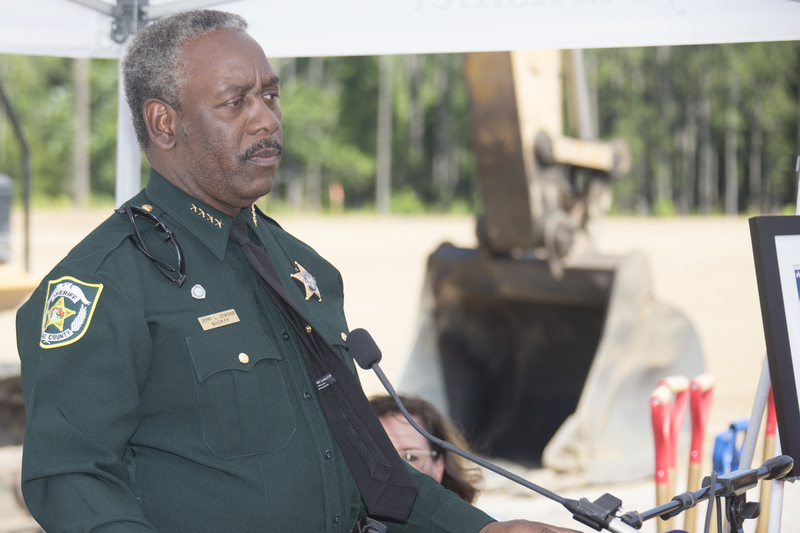 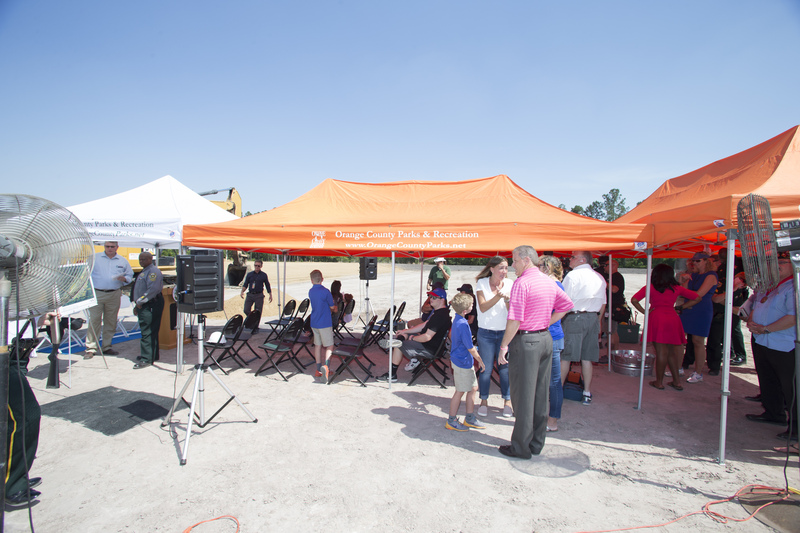 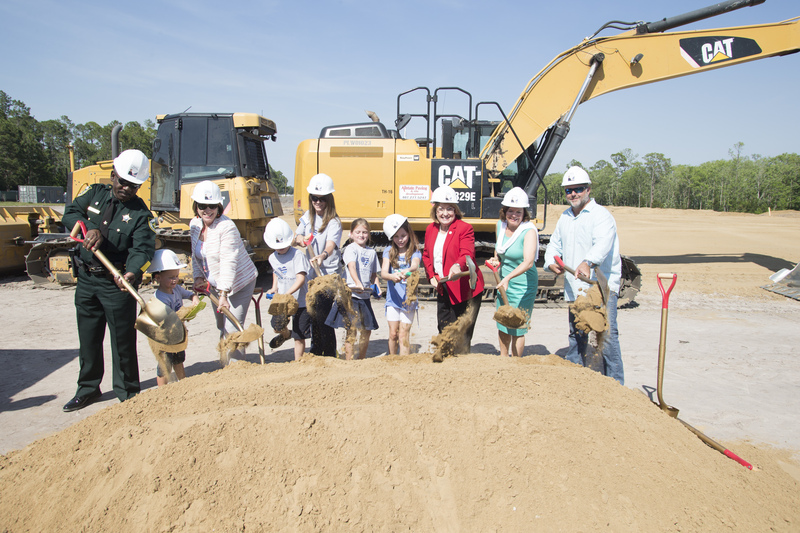 Deputy Scott Pine Community Park will have two multi-purpose fields – one for the new Windermere High School stadium and one for recreational activities. 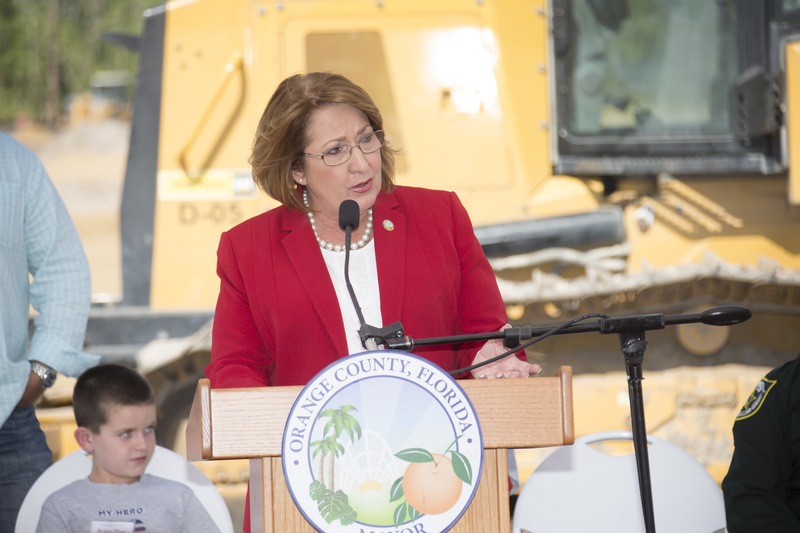 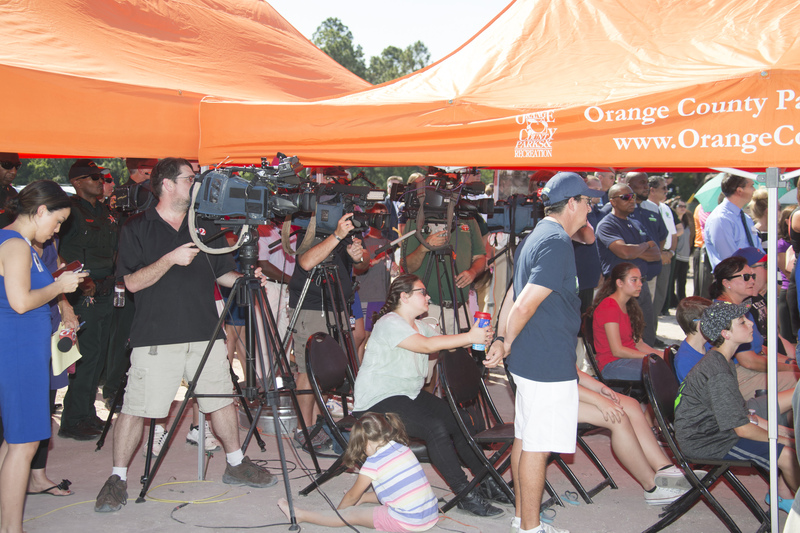 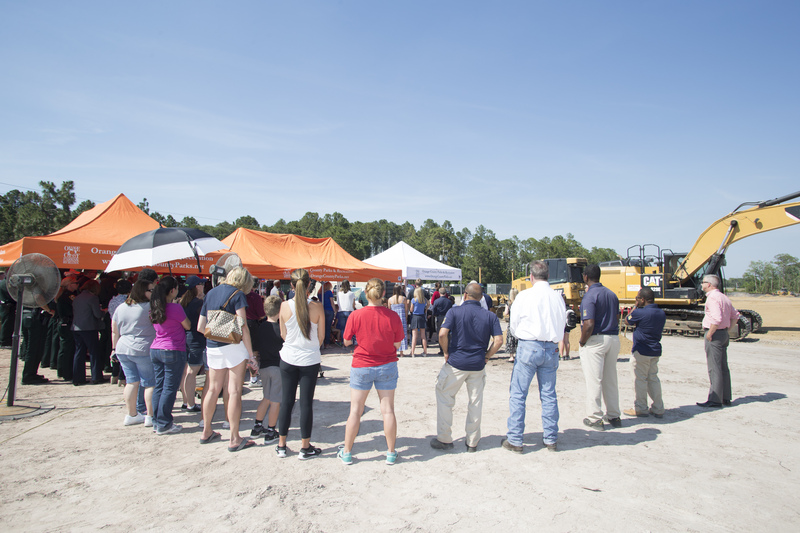 The development will be overseen by Orange County Capital Projects. 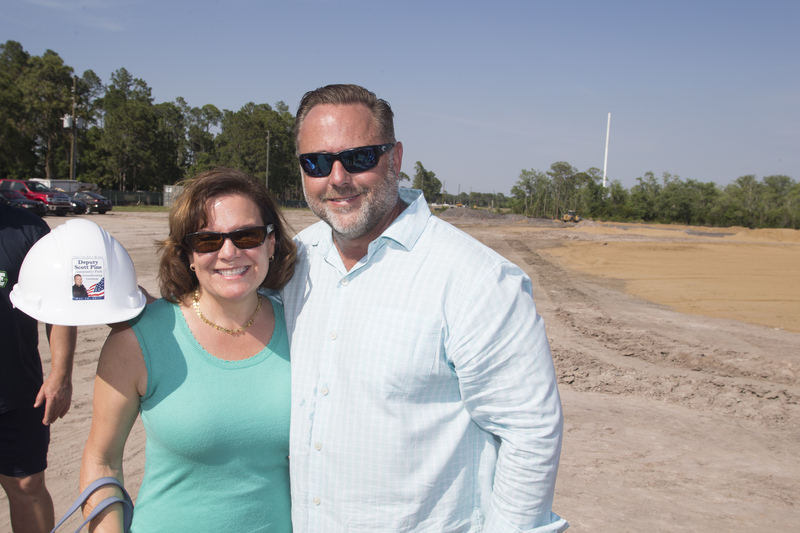 The expected completion date is early 2018. 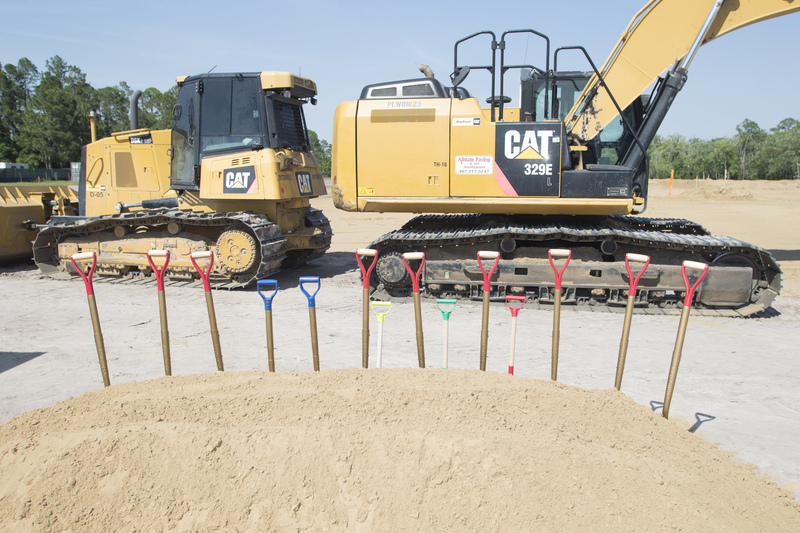 Construction on the 19.5-acre multi-purpose field and stadium has a begun. 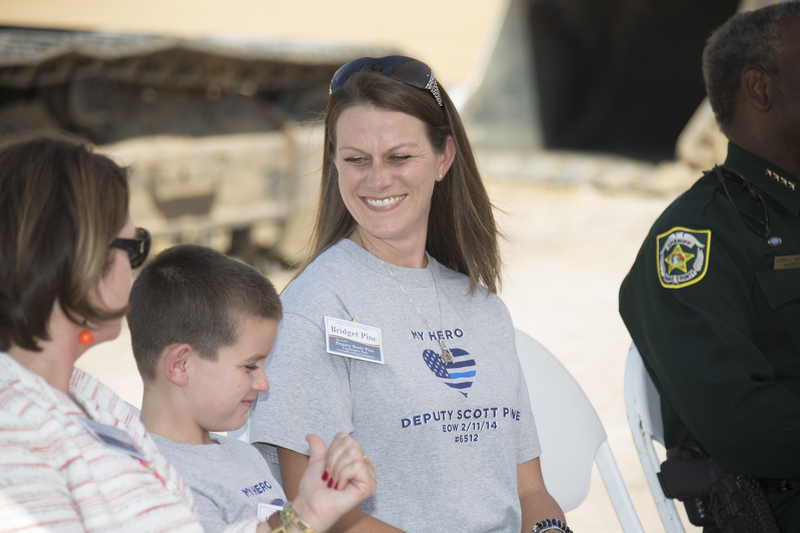 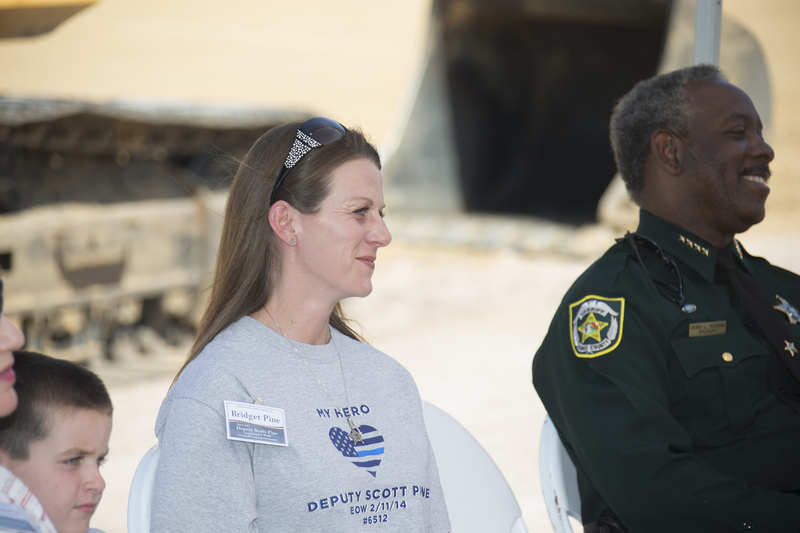 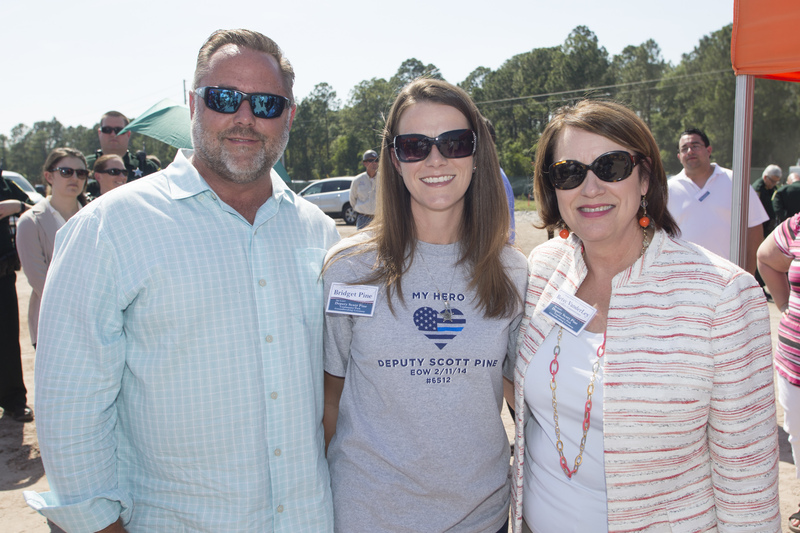 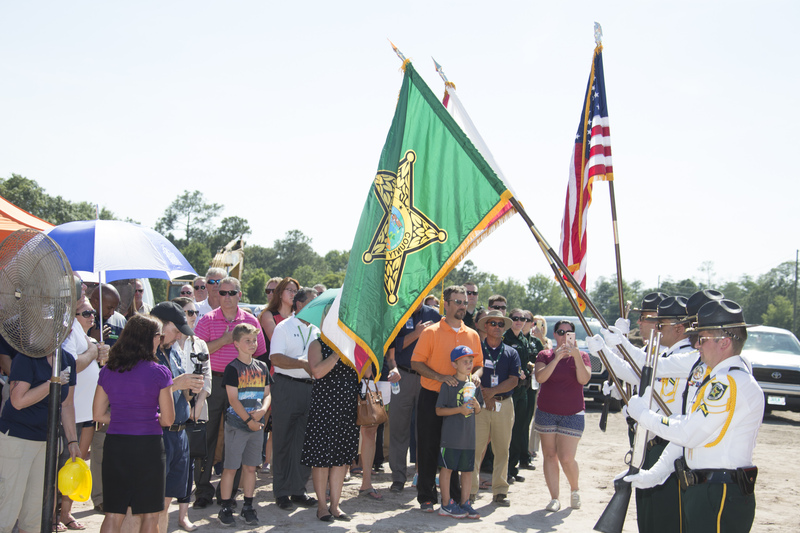 “Our family is truly honored and blessed by the community support of dedicating a park after our hero, Deputy Scott Pine,” said Bridget Pine, wife of the deputy. 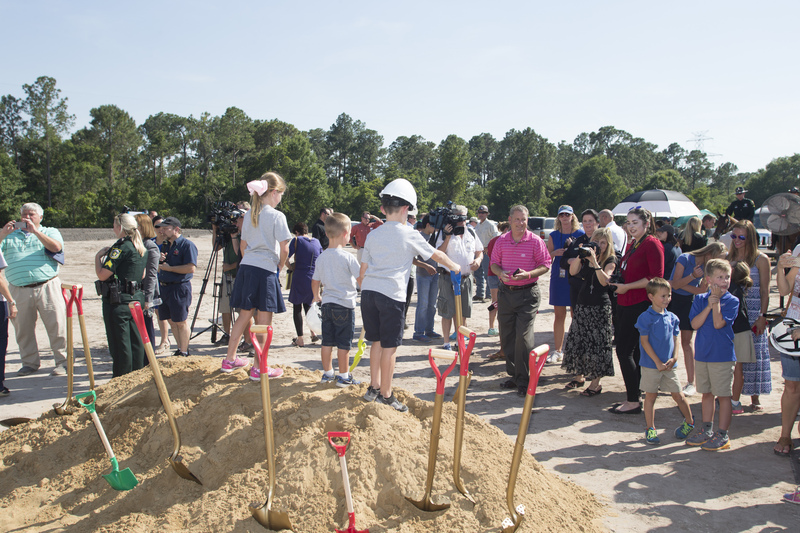 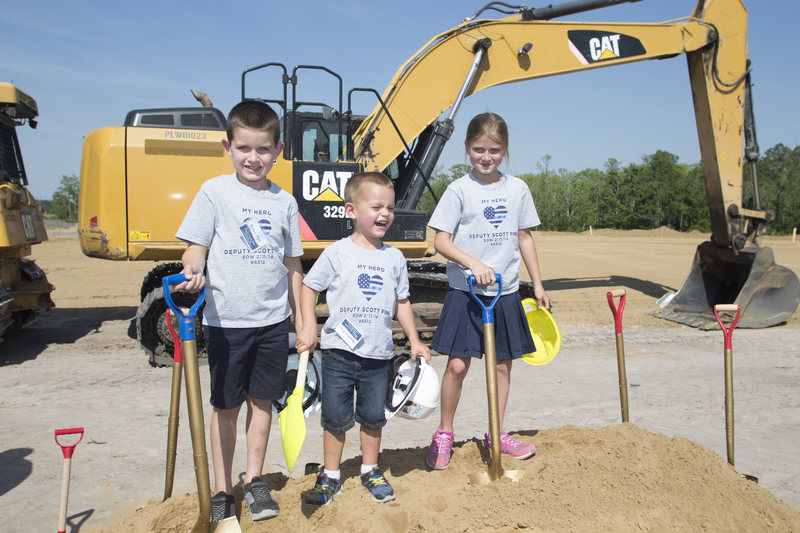 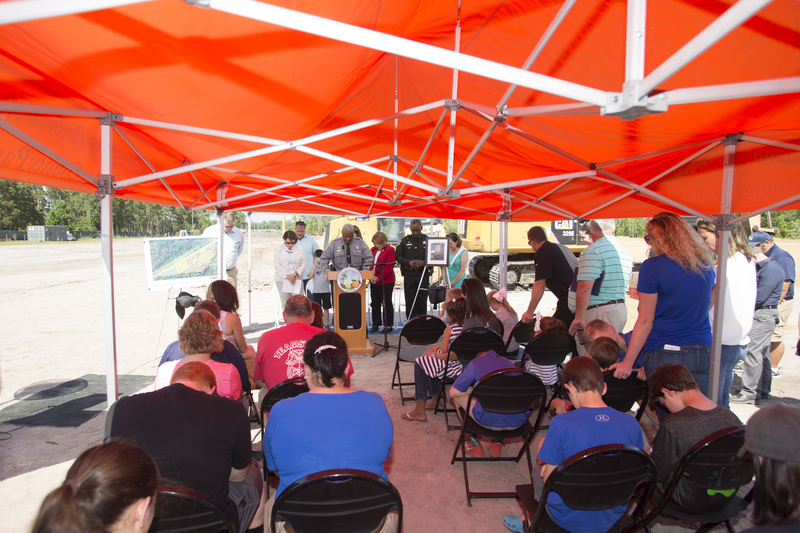 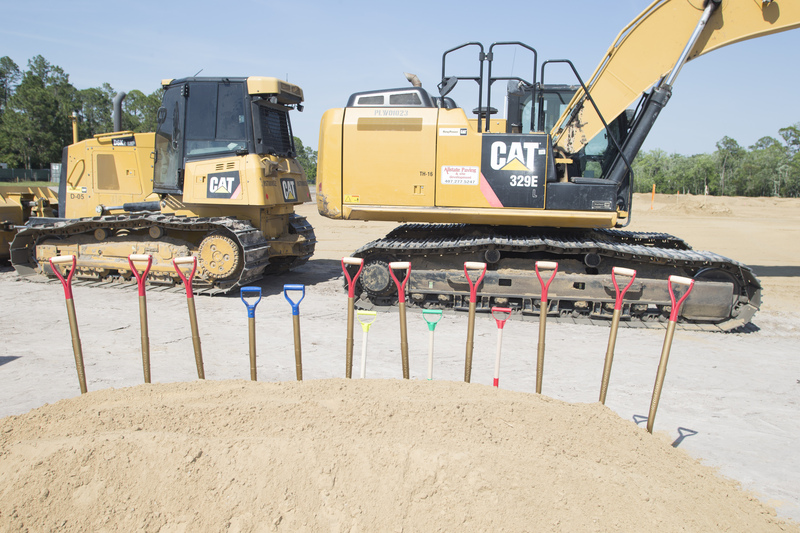 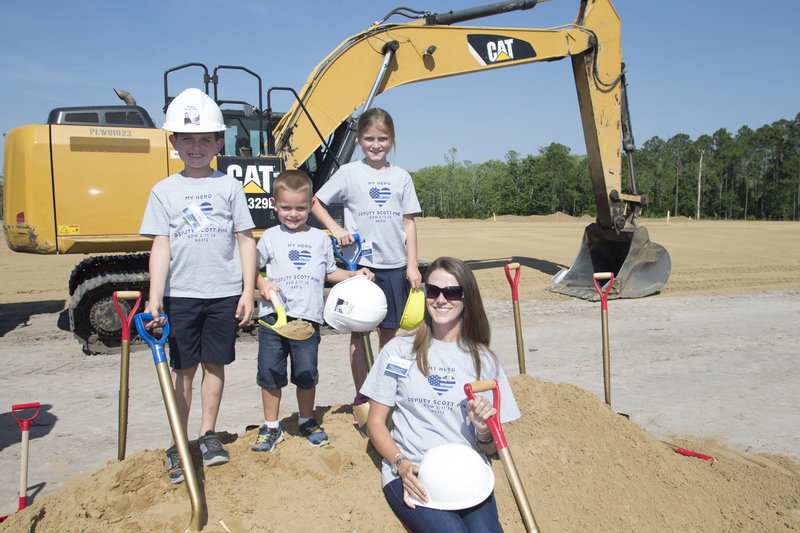 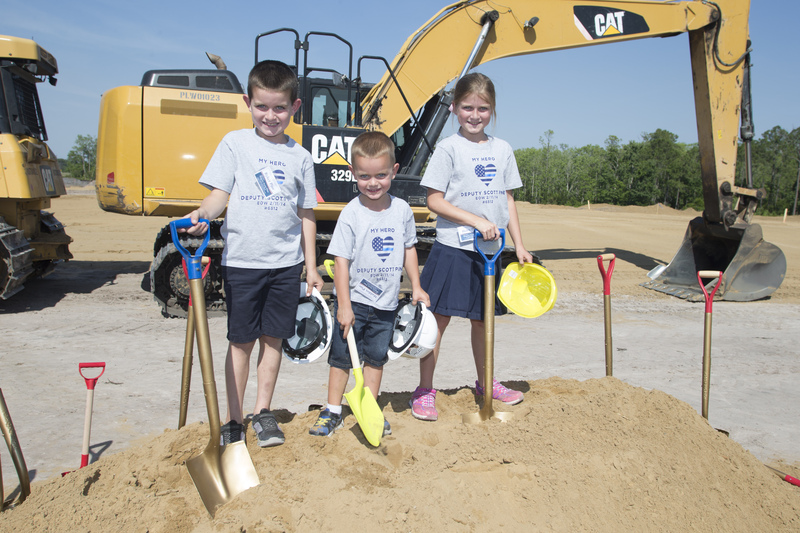 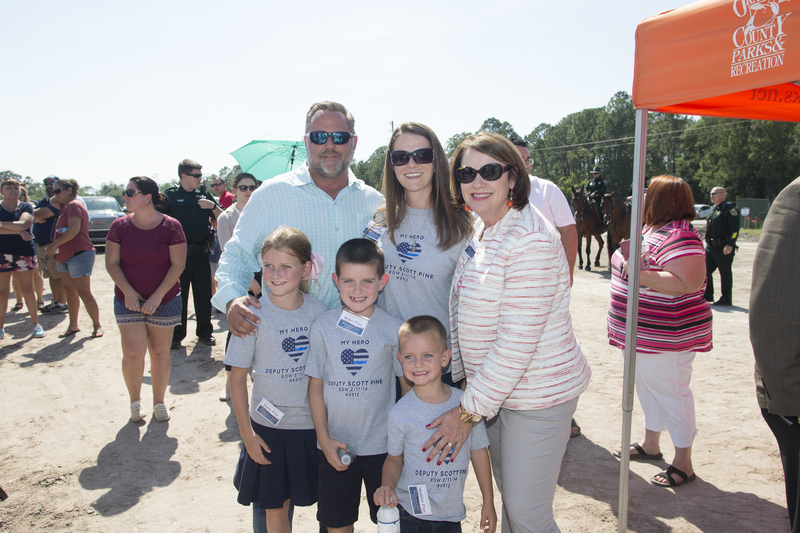 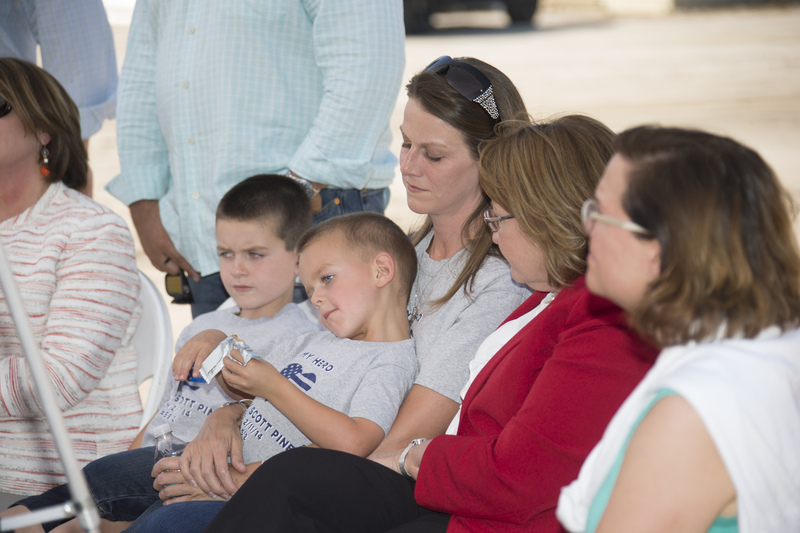 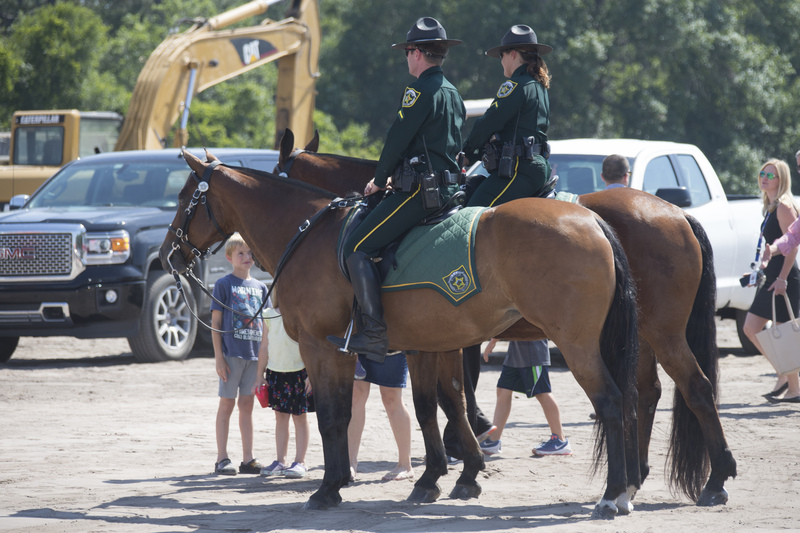 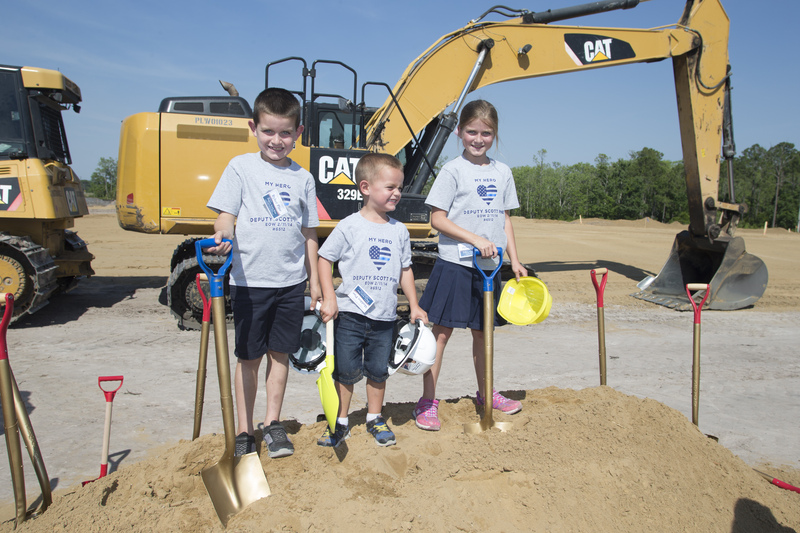 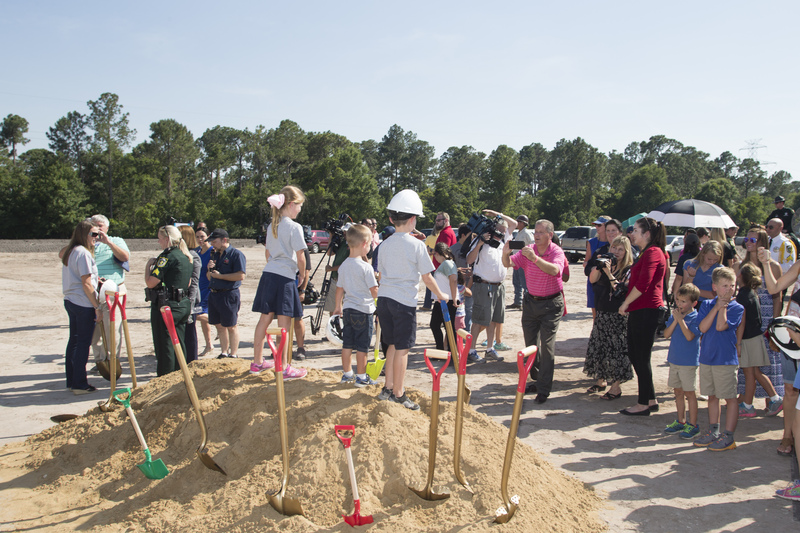 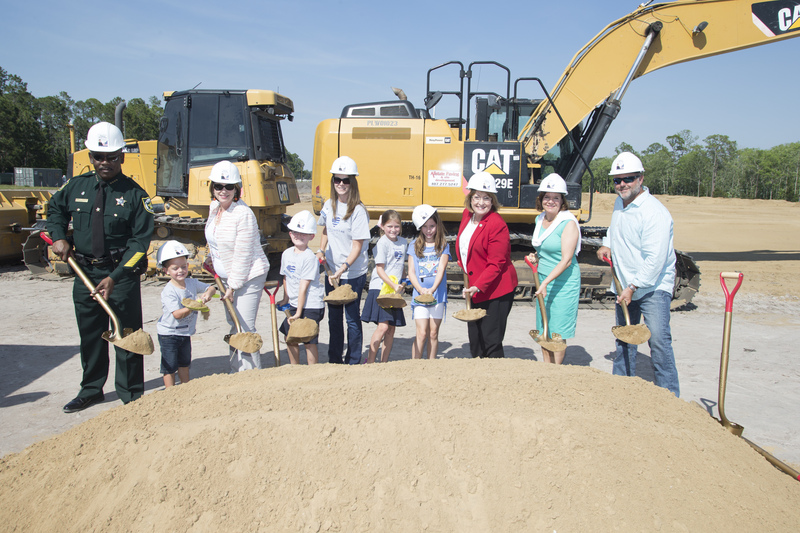 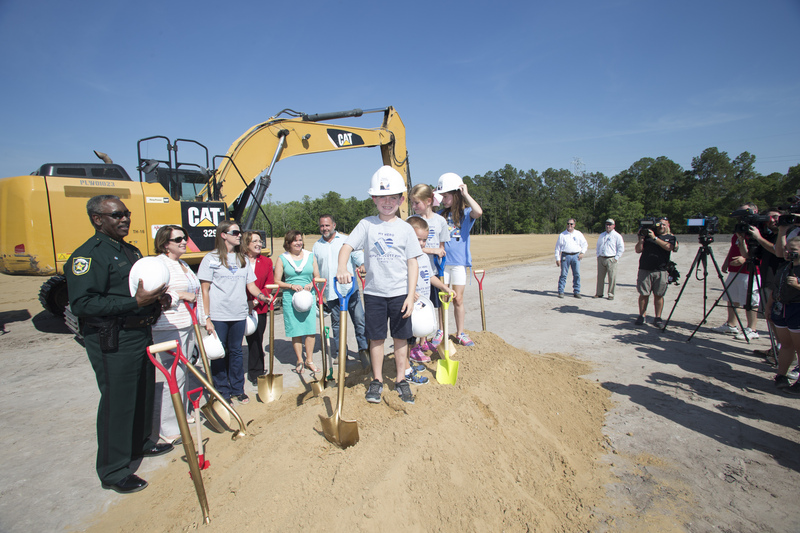 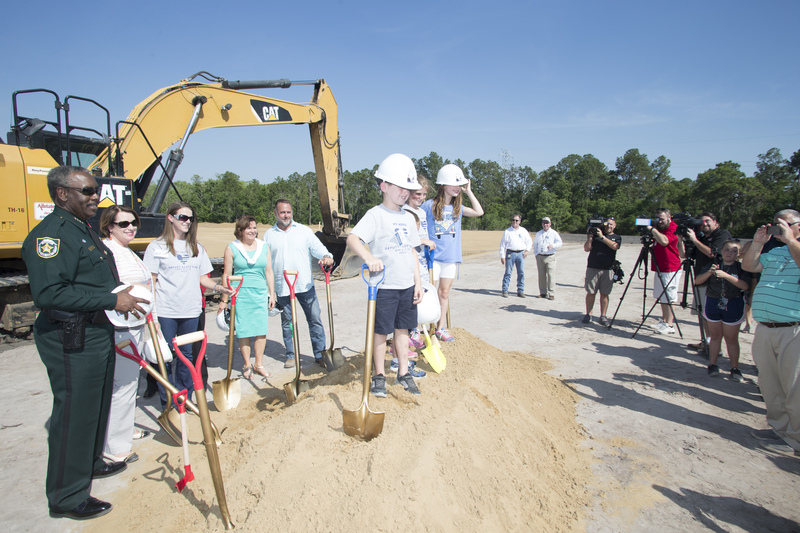 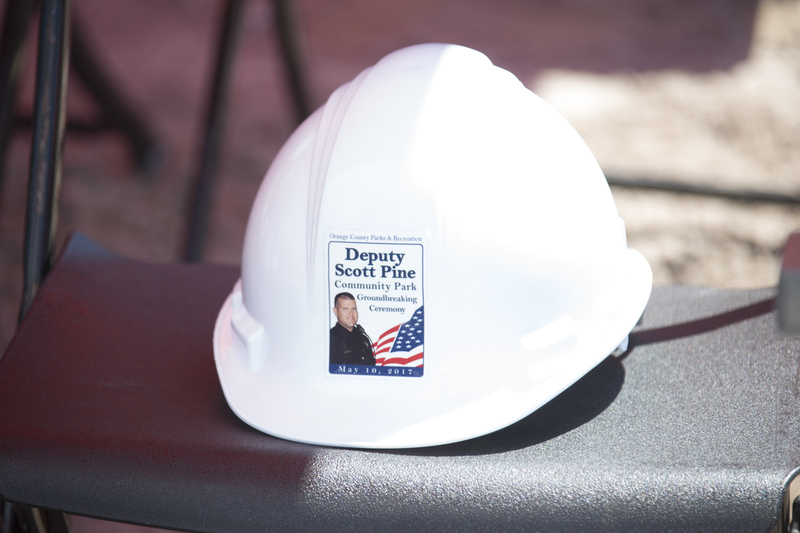 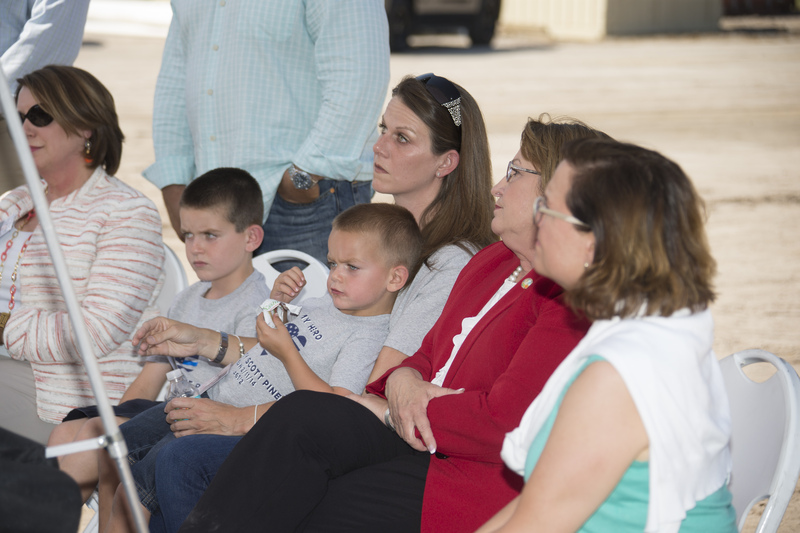 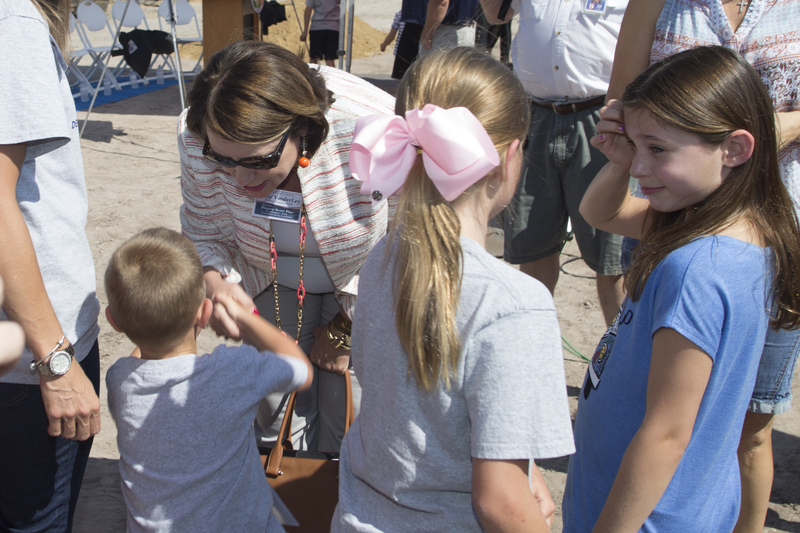 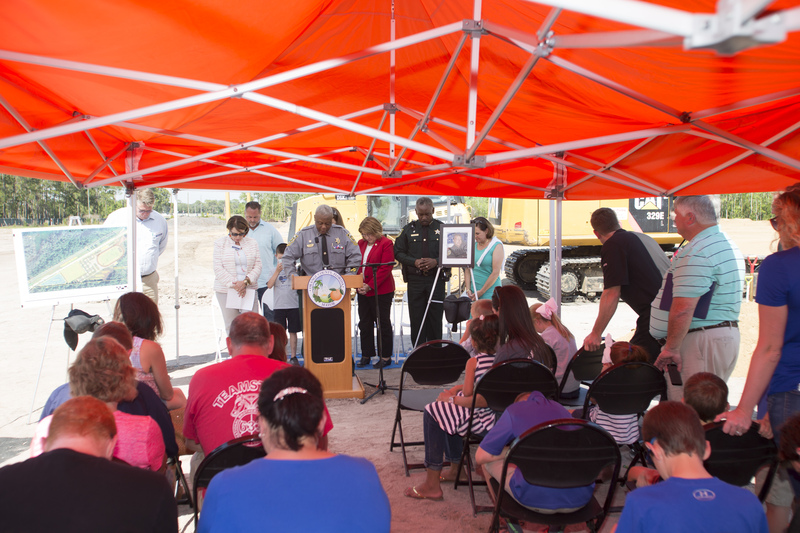 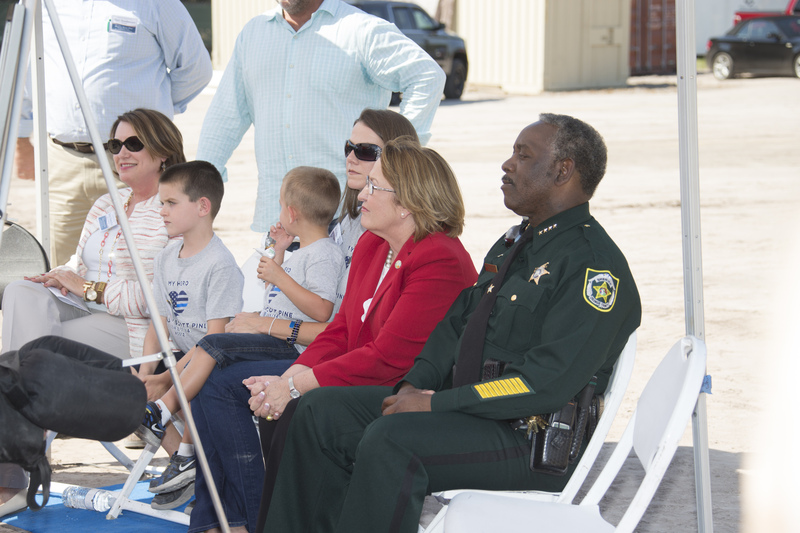 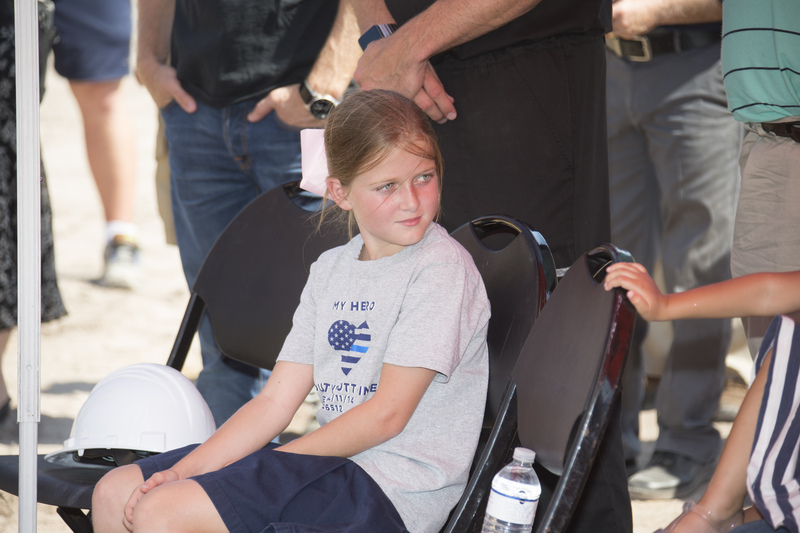 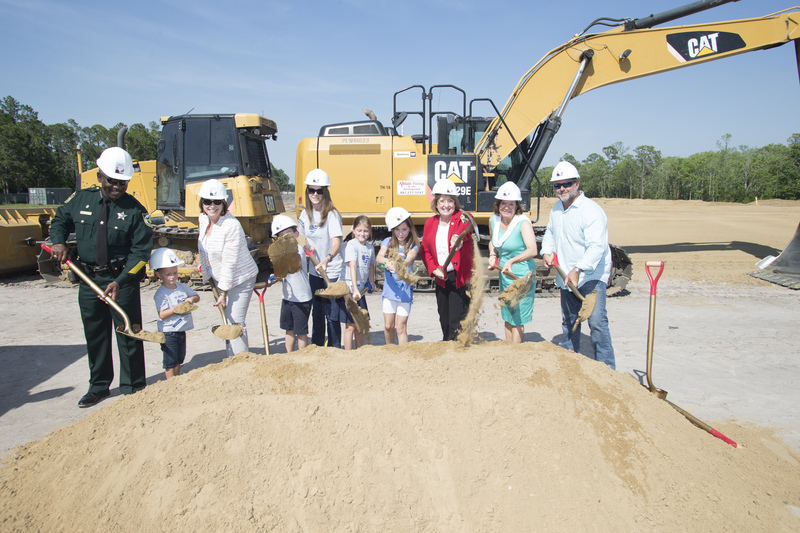 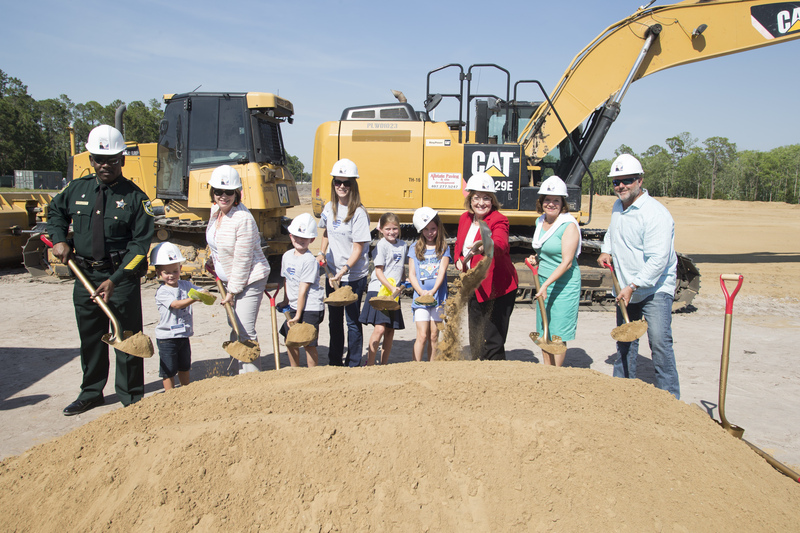 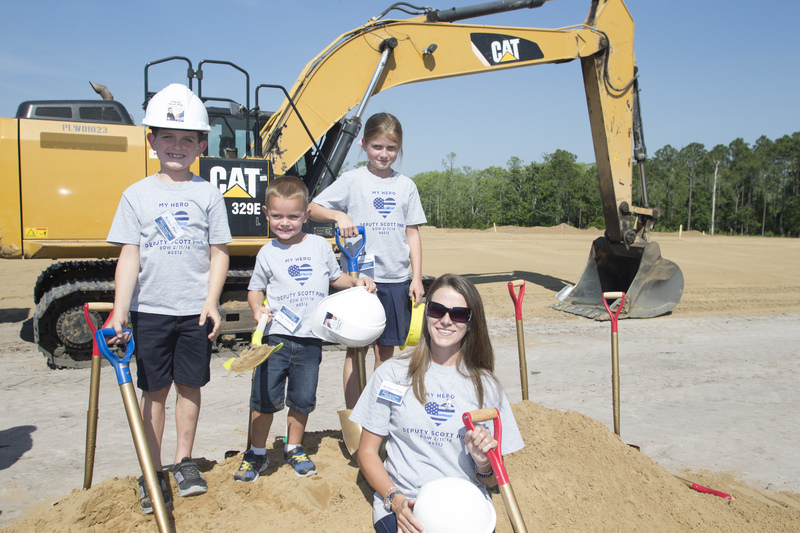 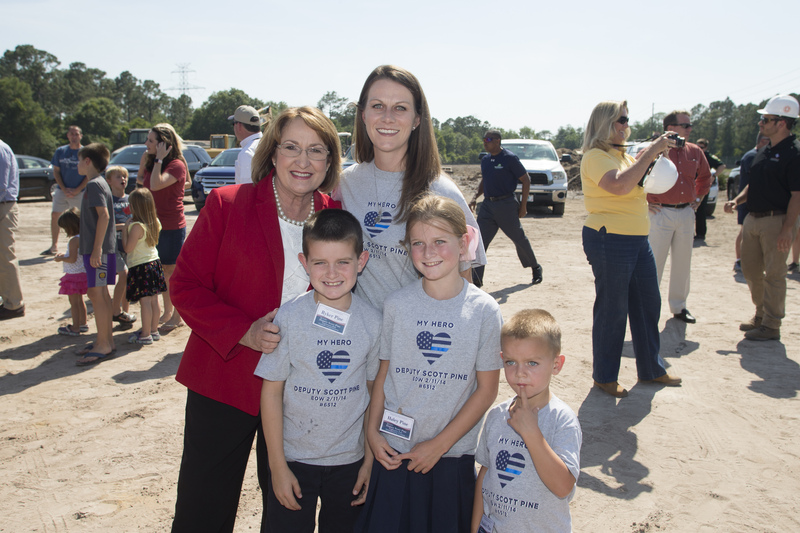 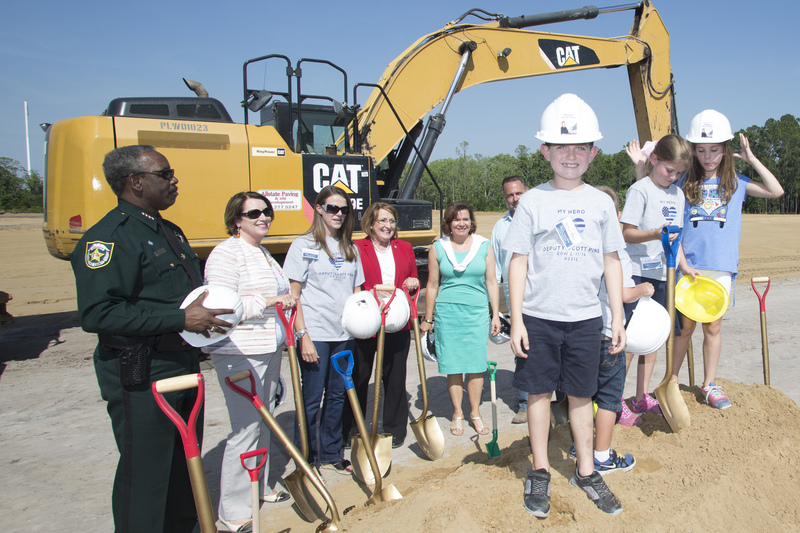 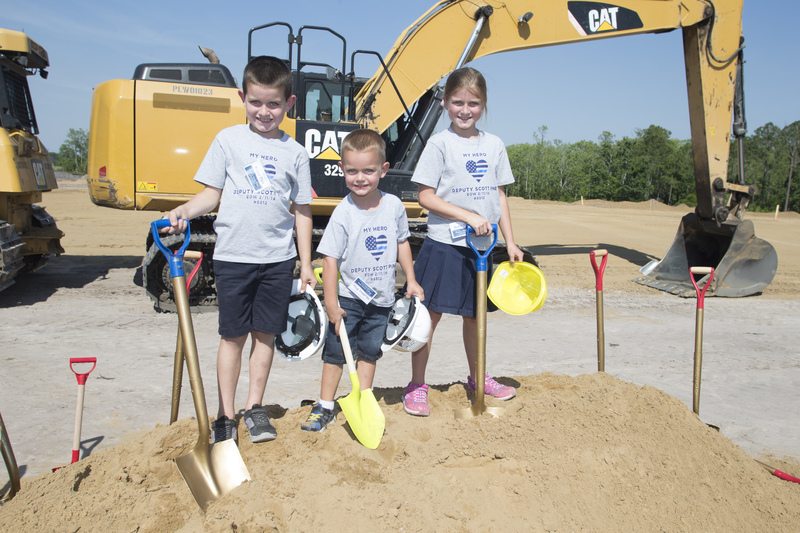 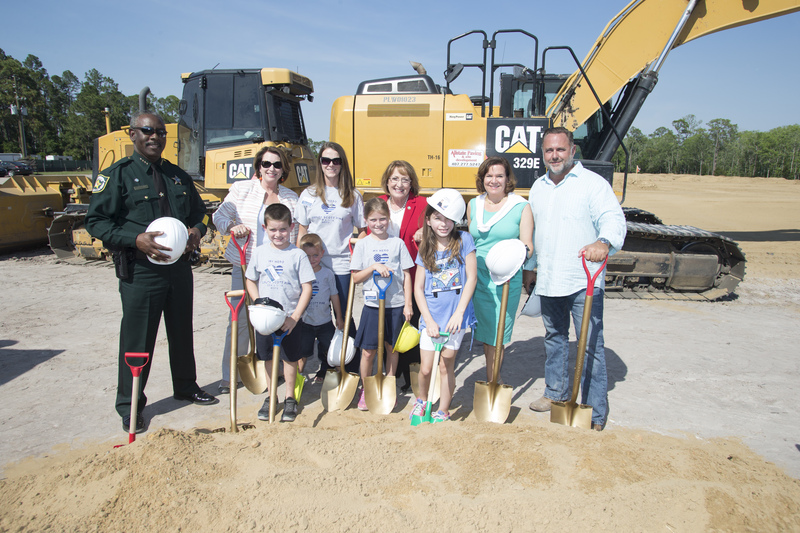 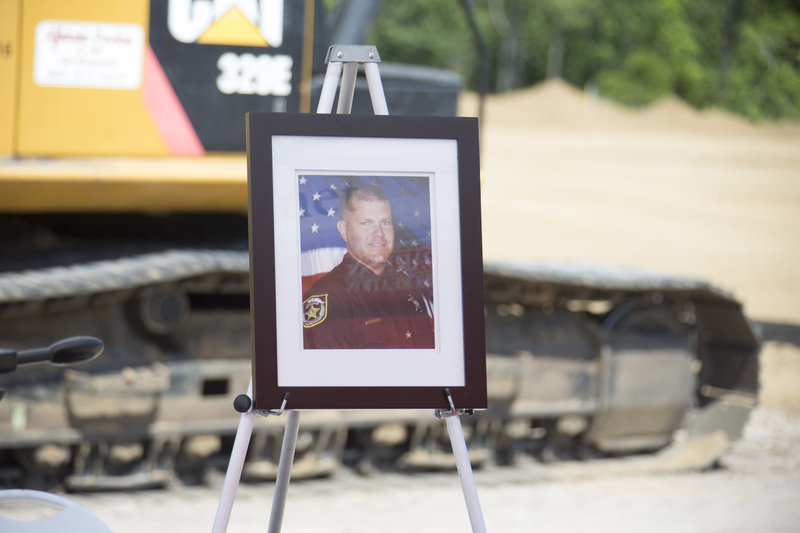 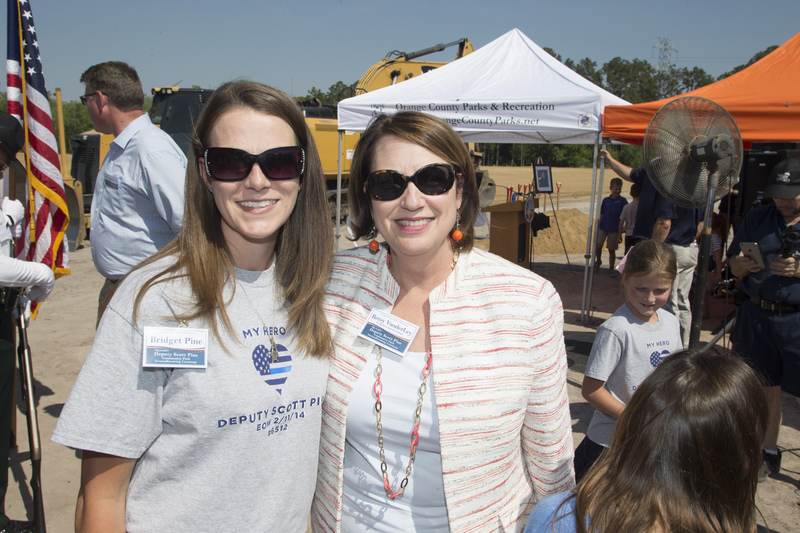 “His legacy will continue to live on through this community park.” Their three children – Haley, Ryker and Maddox – were given yellow hardhats with Deputy Pine’s photo on the front and kid-sized shovels to use in the groundbreaking ceremony. 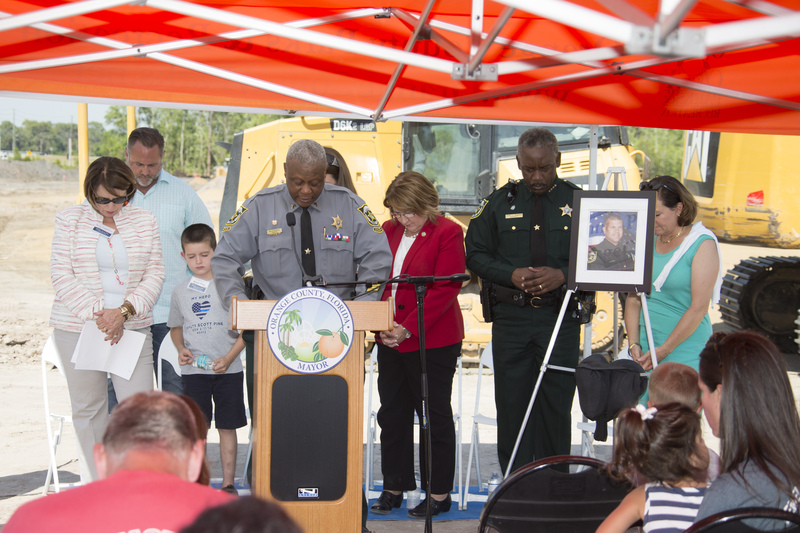 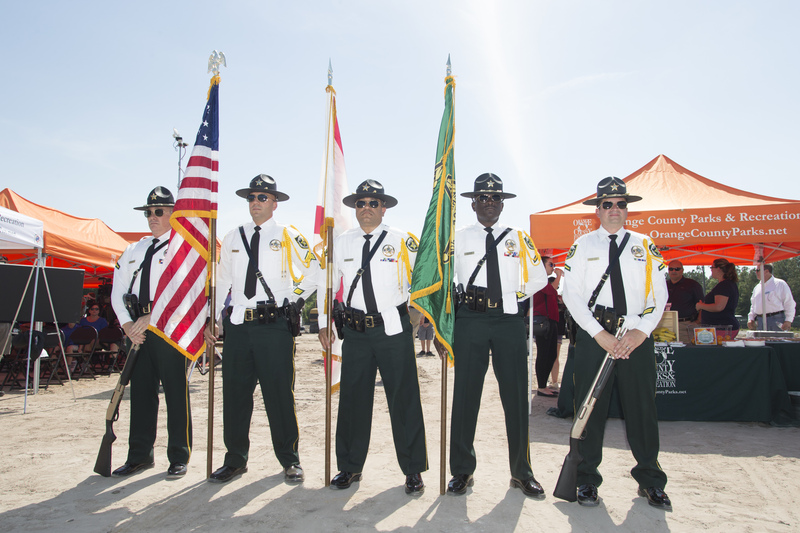 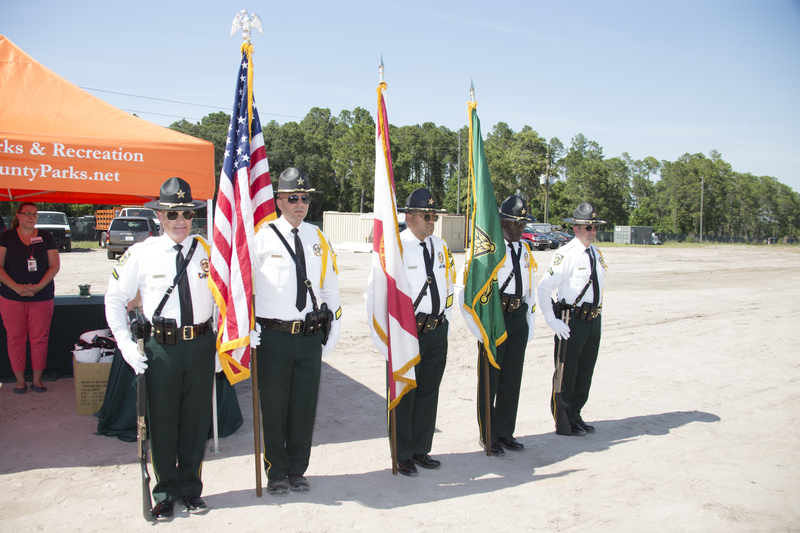 In September 2015, the Orange County Board of County Commissioners unveiled roadway signs in honor of the fallen hometown heroes, Orange County Deputy Sheriff Jonathan Scott Pine and Windermere Police Officer Robert German. 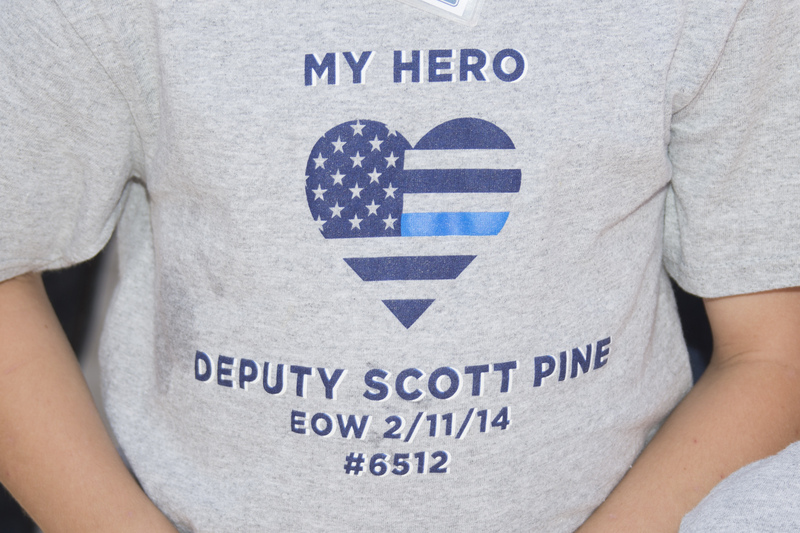 In 2014, both beloved officers tragically lost their lives to senseless acts of violence while in the line of duty. 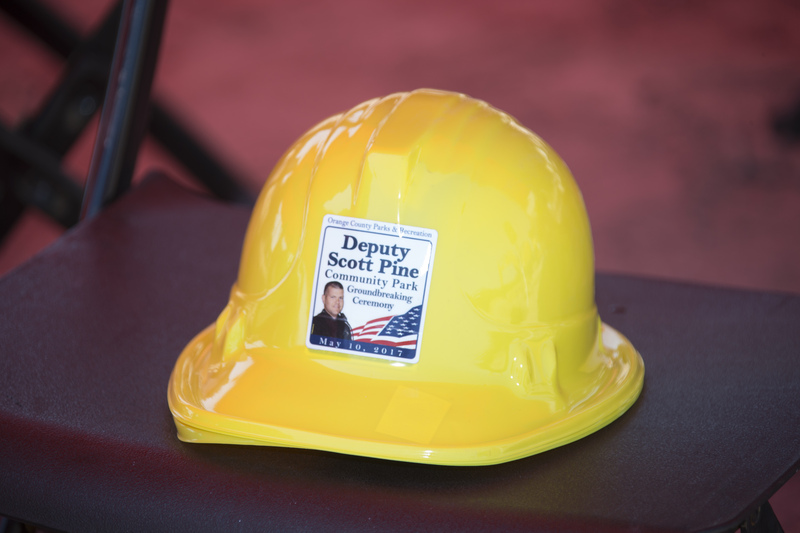 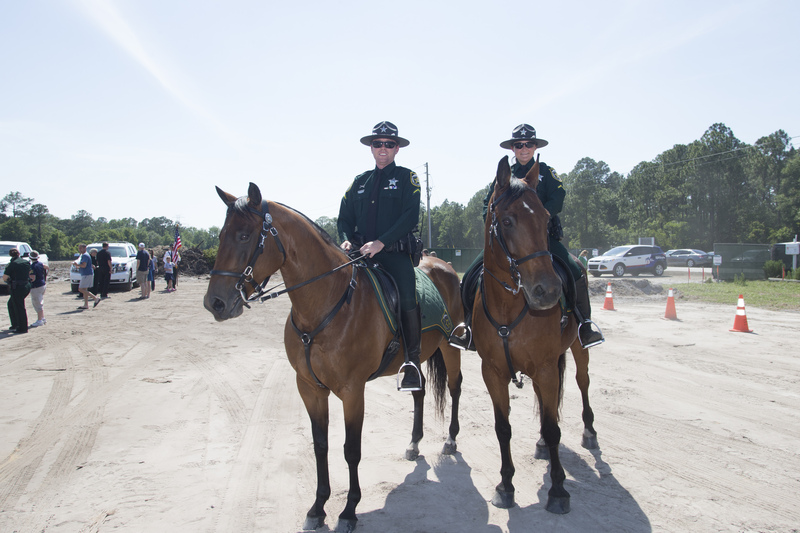 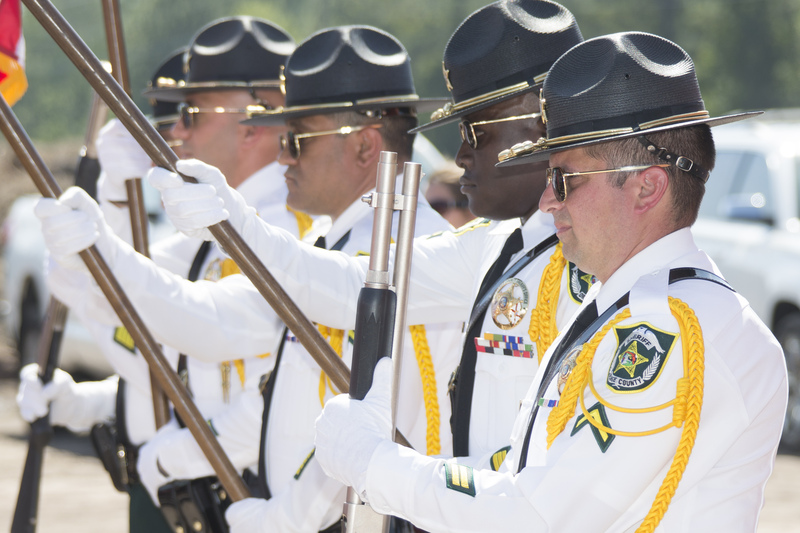 The Deputy Scott Pine Memorial Roadway is located on S. Apopka Vineland Road and Officer Robert German Memorial Roadway is located south of Conroy-Windermere Road and seen by an average of 14,000 drivers daily in West Orange County. 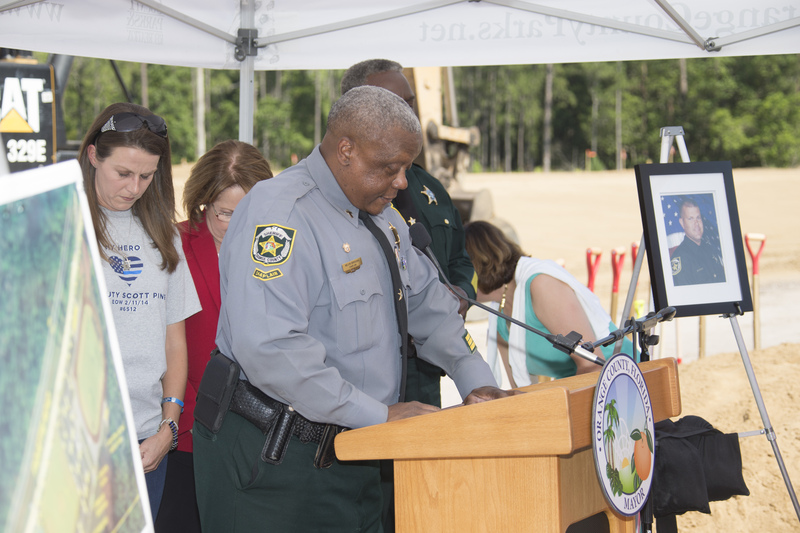 The signs also serve as symbols of gratitude to local law enforcement officers and will help the community recognize the selfless sacrifices officers make on a daily basis to ensure the safety of citizens. 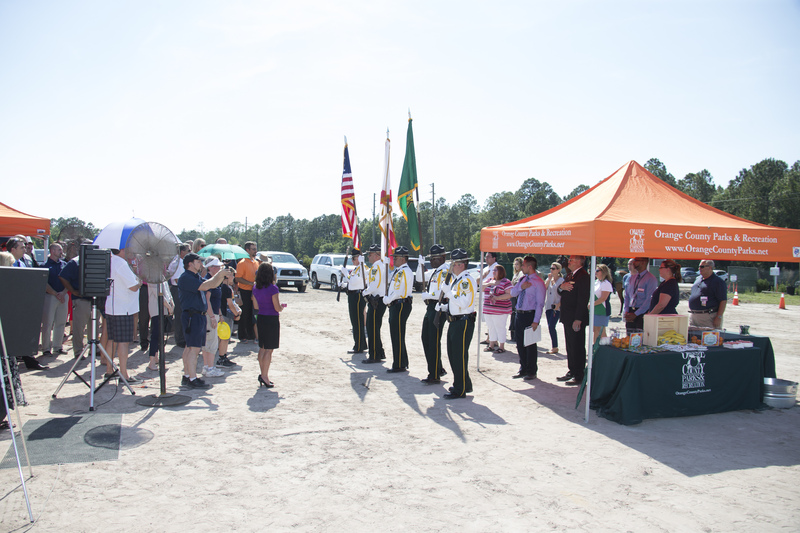 Deputy Scott Pine Community Park is one of 100 parks, trails and facilities that the Orange County Parks and Recreation Division maintains on 15,000 acres of land. 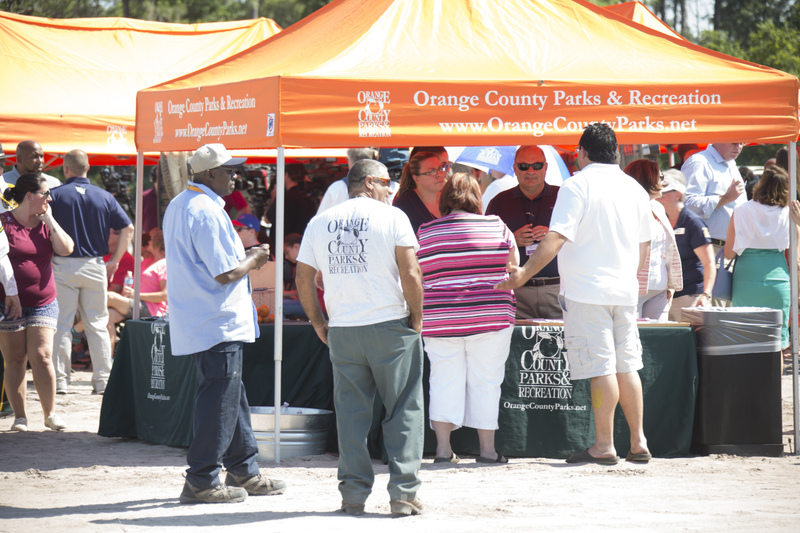 For more information on Orange County Parks and Recreation, visit www.OrangeCountyParks.net. 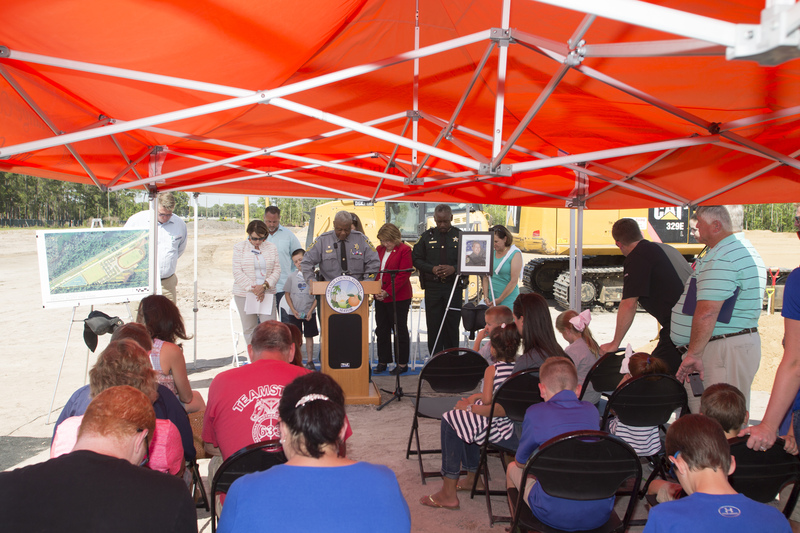 Featured Photo Caption: [L-R] Orange County Sherriff Jerry Demings, Orange County District 1 Commissioner Betsy VanderLey, Deputy Pine’s wife Bridget Pine, Orange County Mayor Teresa Jacobs, Orange County Public Schools Board Member Pam Gould and former District 1 Commissioner S. Scott Boyd joined Deputy Pine’s children to celebrate the groundbreaking of the Deputy Scott Pine Community Park.